Three H/W acceleration modes - DXVA2, QSV, NVIDIA are now natively supported by 5KPlayer 4.9 for Windows altogether! DearMob's free twin-engined 5KPlayer 4.9 for Windows, catching up with the speedy pace of H.264 4K 8K video growing trends, forges itself as a power-efficient multimedia player that supports all DXVA2, Intel QSV, NVIDIA(CUDA) H/W acceleration modes at one go. In this version, three hardware acceleration modes are utilized to accelerate high-res video decoding, conversion and AirPlay process to the utmost extent. Dedicated for high-res video decoding, especially the H.264 encoded files, 5KPlayer 4.9 for Windows fortifies its killer feature - hardware acceleration - to boost GPU video-decoding efficiency and adds up 2 more H/W acceleration modes from its original DXVA2 mode to support QSV and NVIDIA H/W decoding altogether. Different from software decoding, in such wise, users' CPU will be greatly relived from graphics-related tasks to ensure proficient 4K/8K 60 fps video processing workload and even HDR videos, 4K Blu-ray movies. 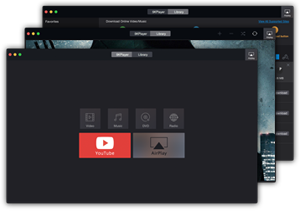 This big move gives Windows users every reason to believe that 5KPlayer's performance has been dramatically enhanced not only in dealing with h264 8K video playback tasks, but YouTube to MP3 3GP conversion and AirPlay mirroring. For high-res video playback and AirPlay mirroring, 5KPlayer's hardware decoding divides the processing burden from the CPU to the GPU. It activates graphic processing unit to precisely decode video files instead of using CPU in general. For YouTube video audio conversion, hardware decoding and encoding shortens the whole conversion time by half to dish out target MP3/M4A/WebM/3GP video audios. 5KPlayer utilizes hardware acceleration to skillfully handle graphic loads, especially when users are about to playback large files like H.264 8K 10bit videos of 60fps yet the CPU is heavily occupied already. Wishing for hassle-free and glitches-free FUHD visuals? 5KPlayer holds the key.